Lucy Carlyle makes a plucky and determined heroine -- she has to be to continue to face down ghosts night after night. She is adventurous, yet moderately levelheaded and makes a nice support of a team consisting of Lockwood (who prefers to charge in guns -- ahem -- rapiers blazing) and George, who's perhaps a little bit too reserved. The chemistry in the team was very entertaining, consisting of the rough bumps and snappishness of a family but also the fierce loyalty and general camaraderie. They worked together well, almost mesmerizingly so in a battle scene. And yet they weren't infallible, and there were times when their age bled through, serving to put things in perspective and up the ante. THE SCREAMING STAIRCASE starts out with quite a kick. The reader is thrown directly into the action with no info dump needed to get a hold of the dramatic and intricate, perhaps far more so than currently seen, world. Ghost hunting, though always carrying an intrinsic fear, was never so intense. The stakes upped. And then they upped again. And right when the plot was tying up, it didn't. So to those of you who've missed the feel of biting your nails, this one's for you. Though it could be considered a 'ghost' book, Jonathan Stroud has broken all the tropes of the genre to bring us a swashbuckling, plot-hole free narrative that just gets better and better. The Bartimeaus Trilogy is one of my favorite series by far. The magic system and depth of the alternate history blew my mind. I can safely say that Lockwood and Co is well on its way to attaining the same. 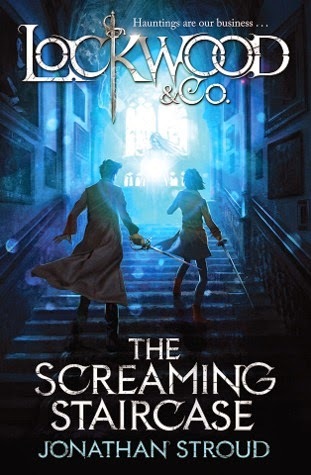 Again set in an alternate London, this time the people are coping with The Problem, a serious rash of hauntings. Reality melds smoothly with paranormal activity, in the newest book from Jonathan Stroud, and also the newest book on my favorites list.